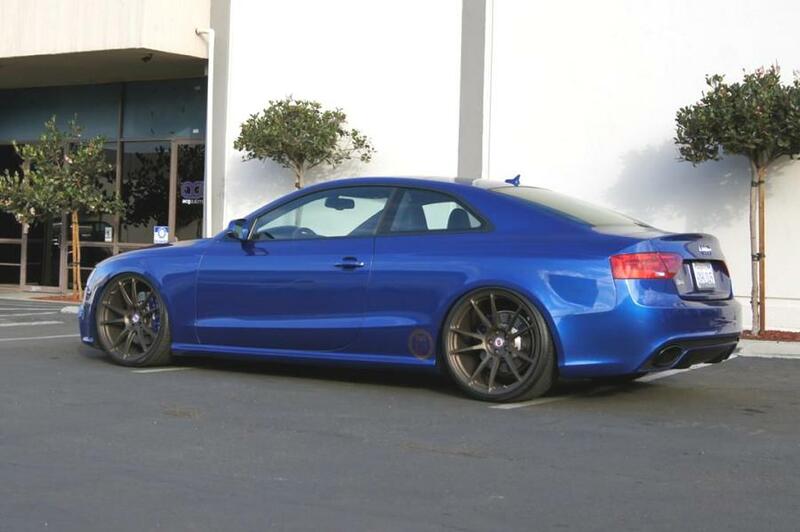 TAG Motorsports - Cars For Sale - 2013 Audi RS5 - Modded! 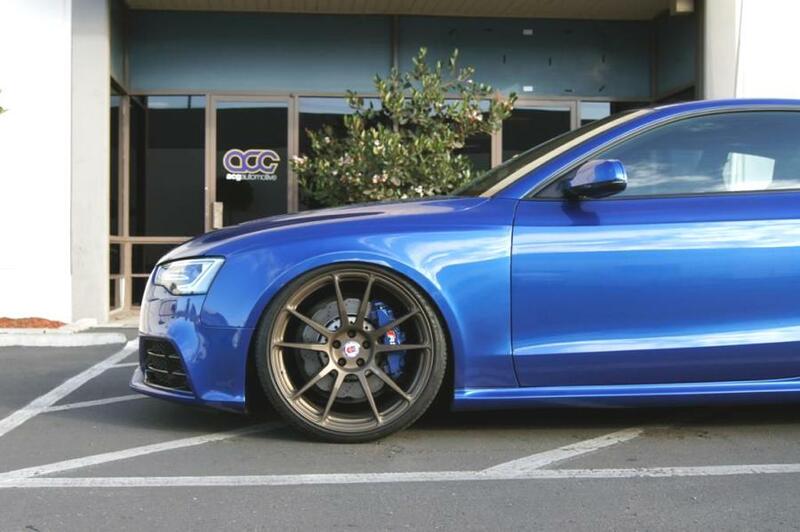 Cars For Sale 2013 Audi RS5 - Modded! 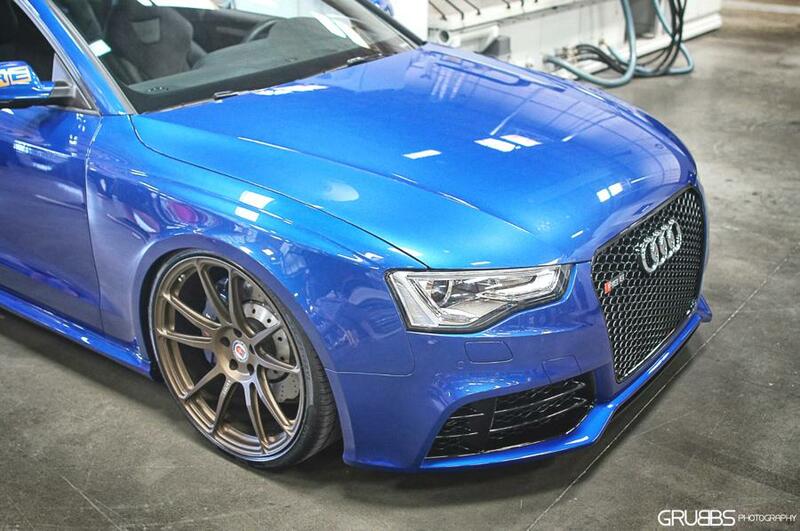 For sale 2013 Audi RS5 Coupe in rare Sepang Blue. Interior is black leather with black alcantara inserts and aluminum race inlays. 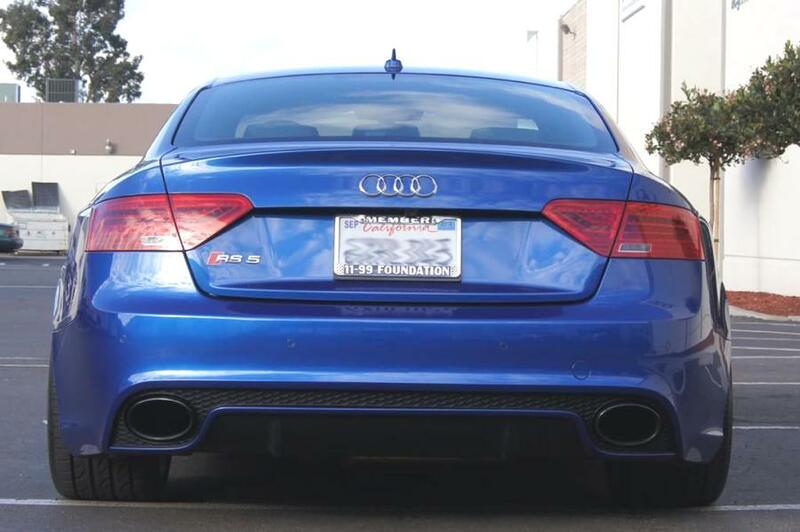 The 2013 Audi A4 and S4 models are both offered in Coupe or Cabriolet (convertible) body styles. 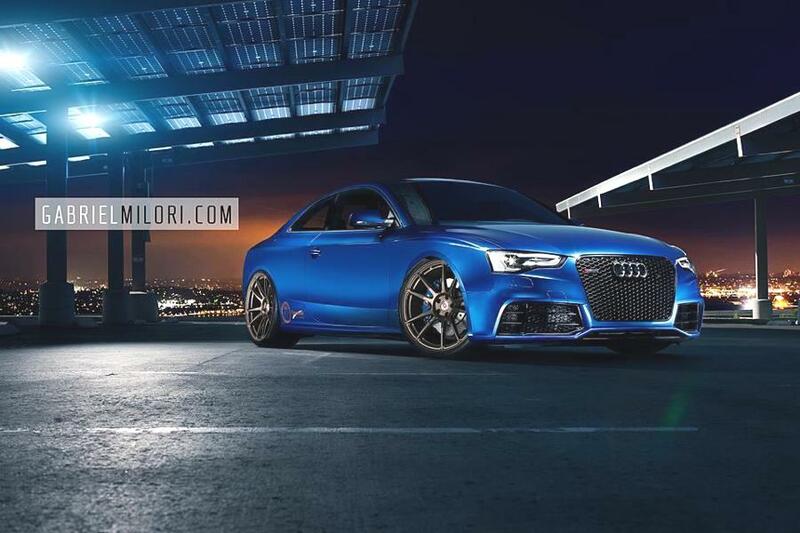 A5 models all come with a 2.0L TFSI 4-cylinder engine, with turbocharging and direct injection, while S5 models get a 333-hp, 3.0L supercharged TFSI V6 engine. Quattro all-wheel drive is included in all Coupe models, but there's a base front-wheel-drive version of the Cabriolet for warm-weather climates. Transmission options are quite different between the two models. Both the A5 Coupe and the S5 Coupe offer a 6-speed manual gearbox, but the front-wheel-drive Cabriolet comes with a continuously variable automatic transmission. 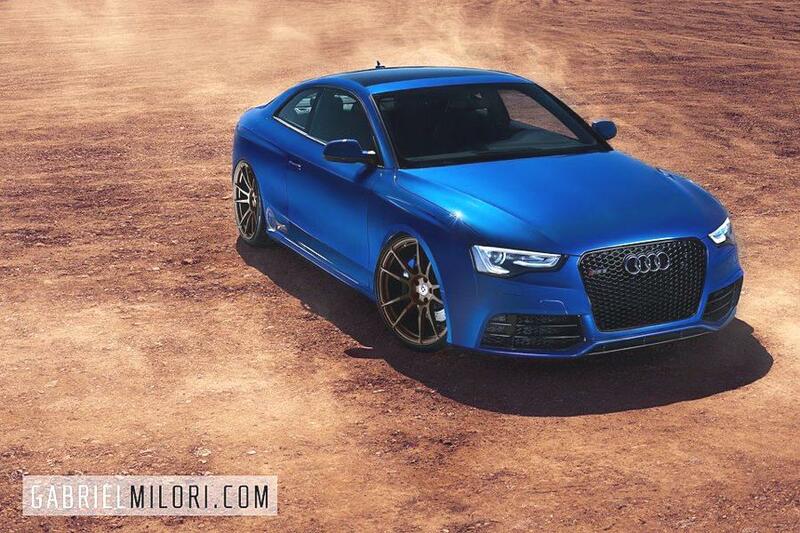 A5 models can be optioned to an 8-speed Tiptronic automatic transmission, while the S5 is offered with a 7-speed S-tronic automatic. 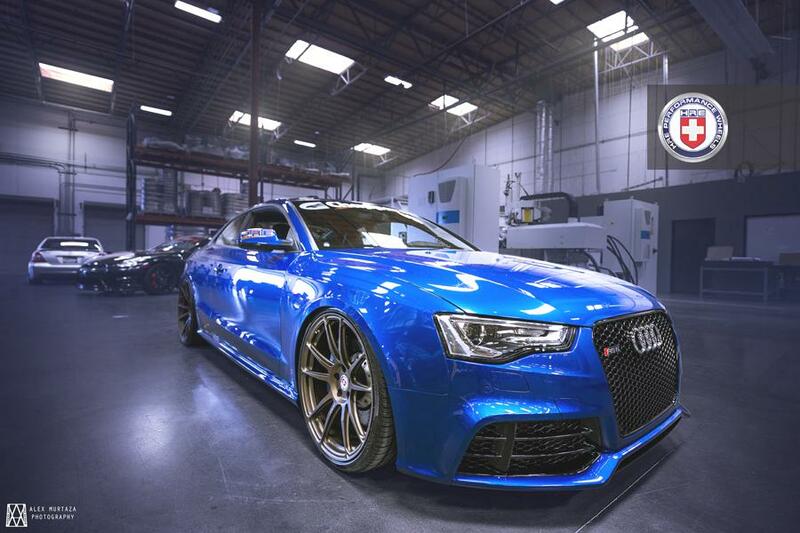 The RS5 Coupe is in another league; it steps up to a 450-horsepower, 4.2L V8 engine and 7-speed S-tronic dual-clutch transmission. Other upgrades to suspension and braking will be included. Most of the A5 lineup gets Audi's Quattro all-wheel drive system, which now sends 60 percent of power to the rear wheels under normal driving, to give these models more of a performance character and a more balanced feel in tight corners. 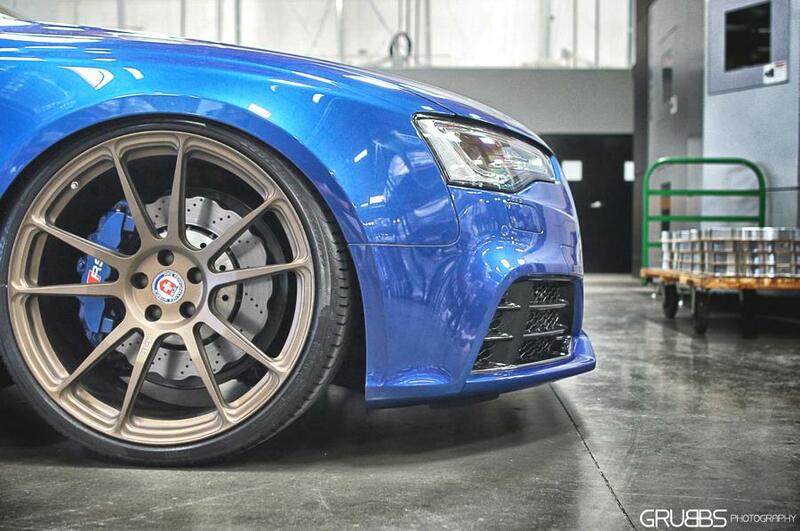 S5 models get a sports differential that helps distribute power to further aid performance. A5 and S5 Cabriolet models feature a power-folding acoustic soft top that can be operated at speeds of up to 31 mph; it also has enough thermal insulation for winter use, and special attention has been paid to trunk space. The top still allows enough trunk space (10.2 cubic feet) for a couple of small weekend bags when folded, and it still allows the rear seatbacks to be folded forward to access more space. The setup includes LED reading lamps and a heated rear window, too. Depending on how much luxury you want built into your A5, there are three different trim levels--Premium, Premium Plus and Prestige. S5 models are available only in Premium Plus and Prestige trims.Base Premium models of the A5 include a panorama sunroof, heated power mirrors, rain-sensing wipers, heated windshield nozzles, leather upholstery, a power driver's seat, cruise control, 3-zone automatic climate control, and a 10-speaker, 100-watt sound system with auxiliary input and SD card slot. Premium Plus add xenon headlamps, LED tail lamps, a Bluetooth hands-free interface, an iPod adapter, heated front seats, driver's seat memory settings and a universal garage-door opener, among other items. Prestige models add Audi side assist, navigation with voice control, Bluetooth hands-free, and a Bang & Olufsen sound system with 14 speakers and 505 watts. Key options include the new Audi adaptive cruise control, which applies the brakes as necessary to keep a safe following distance, which is packaged together with Audi side-assist, a feature that informs the driver of vehicles in the blind spot with lamps built into the side-view mirrors. Heated and ventilated seats are also available as an option, and the comfort front seats in the Cabriolet circulate warm air at neck level to allow you, perhaps, to have the top down in cooler weather. Also available on the A5 and S5 is a new Audi Connect system, with a dedicated Internet connection for the vehicle, which forms its own Wi-Fi network, working with the excellent hard-disc-based navigation system and allowing easy streaming Google Earth imagery for maps, as well as live Google Search, in addition to features for live news, traffic, and weather. The navigation system includes music-storage capability, while the MMI controller for the system has been redesigned with a reduced number of buttons to help simplify operation. All modifications included in the sale. If buyer wants only some mods or wants the car stock I can arrange for that as well. Thank you for looking!